Charlie Keller doesn’t date. How could he risk his kid growing attached to someone when it might not last? The divorced dad’s life revolves around his daughter, his dog, and his job as Maple Springs’ resident handy-man. But when Charlie helps Colin out in a pinch, his world changes forever. Charlie can’t ignore his attraction to Colin, but he can’t act on it either – can he? Being with you changes everything. I’ve never done this before. As winter deepens, Charlie and Colin are drawn into each other’s orbit. But when Charlie’s ex-wife threatens to move his daughter across the country, he realizes his worst fears might come true. And when Colin’s past comes calling, it raises demons he’s not sure he’s strong enough to fight. Will Colin and Charlie’s love flame out, or can they find a way to make a new constellation – just for the two them? Beneath Orion is Book 2 in the Maple Springs series. While each book focuses on different characters and can be read on its own, they’re even more fun to read together. 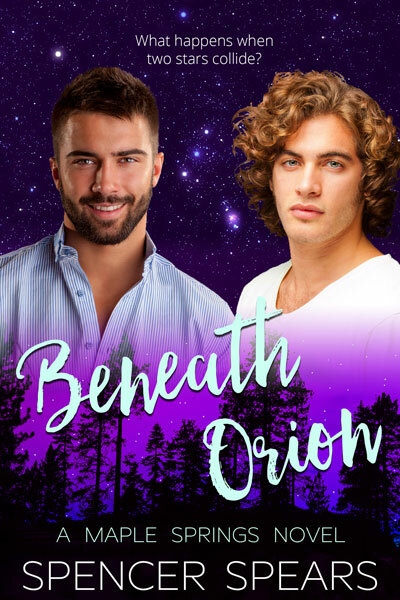 Beneath Orion is a 55,000 word steamy, contemporary, gay-for-you M/M romance. No cliffhangers, no cheating, and a guaranteed HEA.